With our private GP services we aim to give you an appointment on a next-day basis where possible and will always try to accommodate urgent requests on the same day that you contact us. We offer a range of appointment types depending on your needs and during your confidential appointment your GP will discuss any need or concerns you may have. Why should I choose private GP services with Bupa? Here are just a few of the conditions our private GP services can cover. You can visit us for any female health concerns, whether you need a general check-up or you’re due a cervical screening. We also cover all aspects of male health, from testicular examinations to erectile dysfunction and screening for prostate cancer. We all need that extra little bit of support sometimes, which is why you can visit one of our GP's to discuss what’s on your mind. You can visit our private GP's for a wide range of diagnostic tests and scans, giving you peace of mind as quickly as possible. If you’re suffering from abdominal issues, it can have a big impact on your day-to-day life. That’s why our private GPs are here to discuss any concerns you may have. We can check for a wide range of muscle, bone and joint conditions, ranging from arthritis to back pain and osteoporosis. Everyone wants to feel comfortable in their own skin, which is we can diagnose your condition and recommend a tailored treatment plan to restore the health of your skin. If you require an urgent same day appointment, you can normally see a GP on the same-day . Our private GPs can also provide sick notes and fit to work notes. Our opening hours vary by centre, and evening consultations may be available, so please contact us for details. We do not offer a 24 hour ‘out of hours’ service. It’s £70 for a 15 minute private GP appointment and £128 for a 30 minutes. We do offer longer appointments if you think you’ll need longer with the GP (subject to availability). You will be charged extra for additional services, such as a blood test but this will always be explained before going ahead. You can pay by credit and debit card, cheque or cash after your treatment. Do I need to be a Bupa member? No, you don’t need to be an existing Bupa customer to use our private GP service. You can make an appointment with a GP even if you have not used any of our services before. Each one of our health centres has a warm, friendly environment which you can feel comfortable and relaxed in during your appointment. As well as being CQC approved, many of our centres also offer same day test results – perfect if you lead a busy lifestyle. How do I know the length of appointment I need? Female customers: If the purpose of the appointment is for a cervical smear test, please contact the bookings team directly and request to book a ‘GP appointment with smear’. What provision do you have for disabled customers? 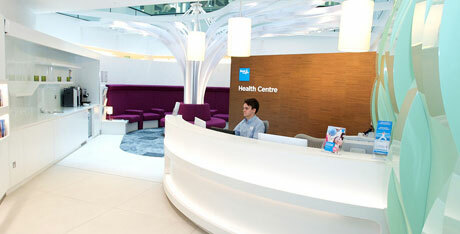 All customers are welcome to attend Bupa centres. Please let us know of any disability at the time of booking so that special arrangements and/or an extended appointment can be made for you if necessary. For customers with restricted mobility we may need to give additional instructions regarding parking or access to the building. Customers with other difficulties such as communication problems should, where possible, arrange for a friend, relative or other assistant to accompany them. For example, this could include a signer. We don't have specialised equipment such as hoists. How long does my appointment last and what happens if it overruns? Most centres offer 15 minute appointments which is usually sufficient for less serious problems or 30 minutes if you feel you need a longer consultation. You can choose your appointment length at the time of booking. If, despite booking a short appointment more time is required, we will endeavour to make this available to you. Extra time is only available in 15 minute or 30 minute intervals and there will be a charge for this. If you need specialist attention, your private GPwill be able to discuss the option of onward referral to the right kind of consultant for your condition. Can I get a sick note /fitness to work certificate? Doctors can issue sickness certificates and fit notes to people to provide evidence and advice about their ill health and fitness for work. GPs at Bupa are able to do this for the problem/illness you are attending for if it’s decided you are not able to work or if advice needs to be given to your employer regarding your fitness to work and any modifications needed. We’re unable to issue certificates retrospectively for an illness that was not assessed by one of our doctors unless you have a recent letter from your specialist or discharge information from a recent hospital admission. Sick certificates/fit notes will usually only be issued for a short periods of time. We’re unable except in exceptional circumstances to issue long-term certificates for chronic ongoing medical problems. These will need to be obtained from your NHS GP. Are you able to refer me to the NHS rather than private specialists and consultants? We do not normally have access to NHS clinics with the exception of accident and emergency, sexual health and family planning clinics. We aim to offer a level of care that is right for you and your circumstance. However, we strongly advise that you remain on the list with an NHS GP, close to your home, to ensure assistance in the event of a medical emergency.